Monitor with control relays, voice alarm, and telephone dialout. Monitors thermocouples, RTD's, pressure sensors, blow sensors, etc., with four alarm segments (LOLO, LO, HI, HIHI)per channel and LCD readout in ºF, PSI, GPM, etc. 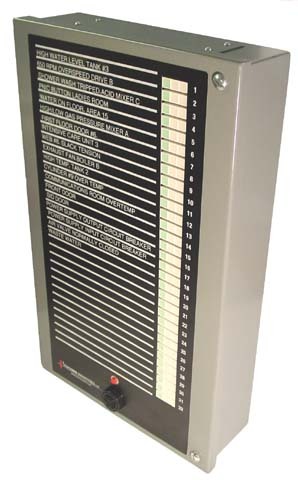 Compatible with our standard annunciators and options. The Mark LX- line of Annunciator/Monitoring Systems is based on 8 point modules that can communicate with each other and other devices over an RS485 bus. This arrangement allows for tremendous flexibility in system physical design configurations and modular customizing of accessories. For example: If configured as a simple wall mount stand alone annunciator, a NEMA 12 hinged door wall mount cabinet (12"h x 12"w x 4.75"d) with built in dual power supply, Sonalert beeper and acknowledge pushbutton. 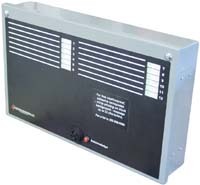 If, on the other hand, the 8 point were desired to be mounted on an existing control panel, the display, Sonalert beeper and acknowledge button could be furnished on a flat plate (10"w x 8"h) to be mounted to the existing control panel door over a cutout and communicate via RS485 bus over one cable with the input board and dual power supply mounted on the existing panels backboard and other features could be added, For example, First Out (which marks the first point to go into alarm) which is useful as a diagnostic tool when monitoring machines or interrelated systems. The nameplate modules can be mounted next to each other vertically or horizontally to fit the display space available. There is no practical limit to the number of display points that can be displayed. For example, a Model LX64H would be a 64 point horizontal system. Click the image below for a demonstration of the different alarm states. Actual size of label is 0.4" high x 7" long (36 Characters) LED's are 0.4" square. NORMAL All points with normal (which can be NO or NC, dip switch selectable) alarm field contacts have the GREEN LED display lit. ALARM When one of the NO/NC field contacts changes status the RED LIGHT flashes (green goes out), horn SOUNDS. ALARM In order to silence the noise, the acknowledge button is pushed - horn goes silent, red goes out, and the AMBER is lit. BACK TO NORMAL GREEN is automatically restored. MOMENTARY ALARM If the alarm condition corrects itself before the operator has a chance to acknowledge, the FLASHING RED stays on and a STEADY GREEN returns simultaneously (horn goes silent). (Click for demo) Marks the first point to fail in a system of interrelated alarms (as on a machine) such that when one fails, they all ultimately go to the alarm condition. Useful for diagnostics. Discriminates in <1mSec. (Click for demo) Any or all points can be programmed to repeat the alarm sequence(flashing red with horn, requiring the operator to re-acknowledge) if the alarm contacts are not back to normal status after a pre-set time has elapsed. used to monitor respirators etc. where acknowledging alarm but delaying action is not acceptable. Any point can be programmed to ignore abnormal alarm contacts for a pre-set time before going to alarm status. Can be furnished in various NEMA (12, 4, 4X, 7, etc.) panels, in almost any number of alarm points. Can be furnished in 316SS and sealed for wash down. Our 8 point Display Modules require 5" height and 5" width minimum (10" wide is standard) and can be mounted side by side for horizontal wide displays. An RS232 (or specify RS485) port for connection to a laptop (or may be connected to a desktop PC). Unit stores and time stamps the last 256 events (in a FIFO format). An event is defined as the alarm, the acknoledge, and the return to normal. This provides a complete written record of the duration of the events. Monitors NO/NC contact alarms as well as analog alarms. Our unit becomes an audio-visual display for your PLC. Your PLC would need to be equipped with a 12 or 24 VDC sourcing or sinking output module (or specify other) any alarm from the PLC is displayed on our unit with audible and can then be tied into any of our options. i.e. phone dial out, first out, etc. Built in dialer can call out to 5 different numbers (phones, cell phones or PAGERS) and deliver four different voice messages (which can be single alarms or groups of alarms). If power failure is an alarm, be sure to specify battery backup. 90 minutes is a standard option mounted inside the enclosure. Any point or group of points can have a single form C relay output, (or specify dual form C, extra contact). Can follow the inputs or follow the alarm. Specify if time delay is desired. Our display with horn and acknowledge pushbutton is provided on a flat plate designed to mount over a cutout and connected by a flexible cord (you specify length) to our field terminal board-power supply which is on a chassis which mounts to your backplate. (Units come in 8 point increments, i.e. NX8, NX16, NX24, etc.) The options can be mixed and matched. A basic list of the options is here. Any size unit can be furnished with the display panel remote from the alarm input terminal/logic board. The alarm input terminal/logic board (11" x 11.25" x 1.25" stackable) digitizes up to 16 inputs in an RS485 loop. Thus, the display panel can be mounted on your enclosure door and a simple low voltage gray telephone cable (4 conductors) use to tie back to terminal/logic board. The terminal boards can be "stacked" using the standoffs supplied up to 3 high (handles 16x3=48 points) on an 11.5 x 11.5 space on your enclosure backplate. Display panel sizes shown can be arranged on your enclosure door either "side by side" for horizontal configurations or "one above the other" for vertical configurations. If needed, 8 point modules can be as small as 7" wide x 5" wide as shown in our 19" relay rack photo. Horizontal units can mix and match these display plates in any configuration, i.e. 3 display plates of 16 points each mounted side by side would make a horizontal 48 point unit or 6 display plates of 8 points would make a 60" wide x 8" high unit of 48 points. Smaller width and height plates can be furnished on special order - minimum size 6" x 6" for 8 points. 8 point 10" 8" 1"
16 point 10" 12" 1"
24 point 10" 16" 1"
32 point 10" 20" 1"
40 point 10" 24" 1"
48 point 10" 28" 1"